The Thais expressed interest in both the T-90 and the latest T-14 Armata to replace the Royal Thai Army’s inventory of outdated American M48A5 Patton tanks. However, the export version of the Armata is undergoing development and it could be several years before the new tank is made available for foreign customers. In the meantime, Bangkok’s needs are fairly urgent, with Cambodia despatching Chinese built tanks to its disputed border with Thailand. The T-90 would dramatically improve the fighting capabilities of the Royal Thai Army’s armoured cavalry battalions. While western tanks are designed to fight in Europe, and Chinese tanks are poor knockoffs of Russian imports, the T-90 is a well-armed apex predator that can outgun and outclass its enemies. It is built to survive in virtually all environments – from snow covered steppes to steamy tropical rainforests and from the Himalayan mountains to dusty deserts. The Thai military only has to look at the Vietnam War to get an idea of how effective Russian tanks have been at jungle warfare. Steven K. Zaloga writes in Osprey Publishing's 'T-54 and T-55 Main Battle Tanks', "While the Vietnam War is popularly imagined as a guerrilla conflict, the 1975 campaign was fought in a conventional fashion, with the new North Vietnamese tank brigades forming the spearhead of the army that overwhelmed South Vietnam." While western tank development has ebbed and flowed, Russian research and development in this field has been steady, reflecting Moscow’s focus on land power. The T-90 is the latest development in the T-series of Russian tanks and represents an increase in firepower, mobility and protection, says Army Technology. Cutting a low profile, it is a fusion of Russian reliability and modern technology. According to Foxtrot Alpha, "The T-90 is lighter and more nimble than her American counterpart, with the A1 Abrams weighting in at 68 tons compared with the T-90's 48 tons. You read that right, the T-90 is a whopping 40,000lbs lighter than the M1A1 Abrams! The T-90's lower mass results in a smaller, less expensive package, that can do some fairly spectacular maneuvers, whether it be on the open range or in tight urban environments." Because of its comparatively light weight and brisk pace, the tank is able to effortlessly leap over obstacles. It is, therefore, known as the “Flying Tank”. However, there is no compromise on armour protection with plenty of padding provided by explosive reactive armour. What must have particularly interested the Thai military is the T-90’s ability to fire anti-tank rounds from its 125mm main gun. These laser guided rounds can strike ground based and low flying aerial targets at close to double the range of the T-90's main gun. It means the tank’s crew will not lose precious seconds switching ammo between different launchers. In war, while the quality of equipment is important, it often boils down to which side can take that crucial first shot. Visibility is another issue in places such as South East Asia. The T-90 solves that with a world class sighting system that allows them to have increased situational awareness and the ability for enhanced shoot-and-scoot capability which is crucial for winning on the modern . Not only is the T-90 a versatile weapons platform, it offers an excellent balance of capabilities and cost. The key test of any weapon is its effectiveness and popularity in foreign markets. The T-90 is a sought after tank abroad. The biggest foreign buyer is the Indian Army – the world’s third largest operator of tanks – which plans to acquire more than 1,600. 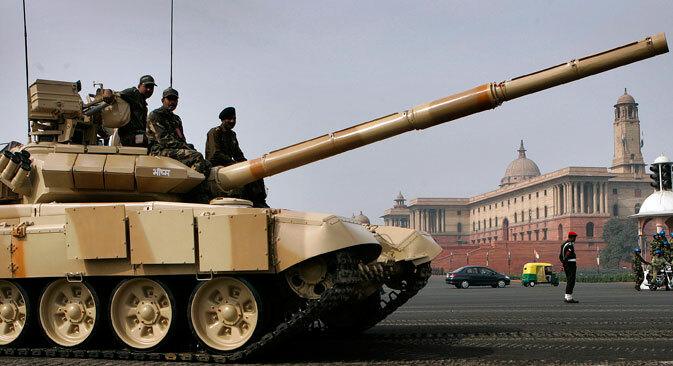 India is equipping 21 tank battalions (regiments in India) with the T-90s which will operate in the heat and dust of the Rajasthan desert as well as the freezing heights of the Himalayas. Other customers include Algeria (which has 305 plus an option for 200 more), Uganda, Syria, Azerbaijan and Turkmenistan. Potential customers include Cyprus, Peru, Venezuela and Vietnam. In 2011, Thailand placed a $240 million order for the purchase of 49 Ukrainian-made T-84 ‘Oplot-M’ tanks. Like all things Ukrainian, it turned out to be a complete disaster, with the Royal Thai Army receiving only 10 tanks by 2015. Yes, that’s correct – 10 tanks in four years. But that’s hardly a surprise. In 2015, Ukraine ‘lost’ five An-32 cargo planes belonging to the Indian Air Force. These planes were part of a batch of 40 that had come in for contracted upgrades and refurbishment. The Thai leadership has learned from its mistake and has decided to deal directly with Moscow. Again, the M-1 Abrams, the primary American tank, has a gas turbine engine, which proved to be a nightmare for the US Army tank crews during the Iraq War. Sand proved to be deal breaker and over 1000 engines had to be laboriously removed and shipped back to depots in the US, creating a massive maintenance logjam. Considering the vexing issues facing the world’s main tank makers, Thailand is right in taking baby steps towards a military deal with Russia.